A Los Angeles Lakers spokesman said there are “different interpretations” about what happened during an interaction between players Nick Young and Jordan Clarkson and a woman who accused them of harassing her. Coach Byron Scott also said he spoke with the players about Sunday night’s incident in Hollywood with Alexis Jones, an activist and public speaker against sexual harassment and domestic violence. The Lakers haven’t indicated any intention of taking disciplinary action against Young or Clarkson. Jones claims that at least one of the two players gestured obscenely at her and her mother while the parties’ cars were stopped at an intersection. After Jones posted the players’ photos on Instagram with a message describing “disgustingly vulgar gestures” made by some of the four men in the car, commenters informed her that the men were Young and Clarkson. Black said the Lakers attempted to arrange a meeting among Jones, Young and Clarkson to talk about what happened, but Jones’ schedule didn't permit it. He said the Lakers are interested in inviting Jones to address the team about issues of respect. 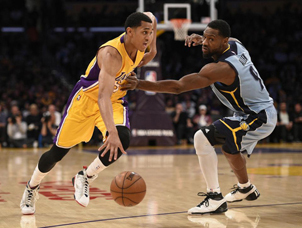 Clarkson is the Lakers’ starting shooting guard, ranking second on the team with 15.5 points per game. He has emerged as a dependable NBA regular in two seasons since the club drafted him in the second round out of Missouri. Young is a Los Angeles native and a flamboyant backup guard for the Lakers, although the USC product nicknamed “Swaggy P.” has made increasingly meager scoring contributions this season. He is engaged to Australian rapper Iggy Azalea. The Lakers are the Western Conference’s worst team at 15-55 even after beating Memphis to snap a four-game skid.